The flower gardens virtually disappeared after Jefferson's death in 1826; however, they were revived and restored by The Garden Club of Virginia between 1939 and 1941. Researchers found Jefferson sketches of the Winding Walk Flower border and and the oval bed plan, and were able to observe the depression of the Winding Walk Flower walk by shining the headlights of their automobiles across the West Lawn at night. Perennial bulbs continued to flourish along the border after 115 years and so outlined its location. The ensuing restoration seems unusually accurate, especially considering the state of the art of landscape and garden restoration at the time. In late April spring bulbs, especially tulips, dominate the stage. 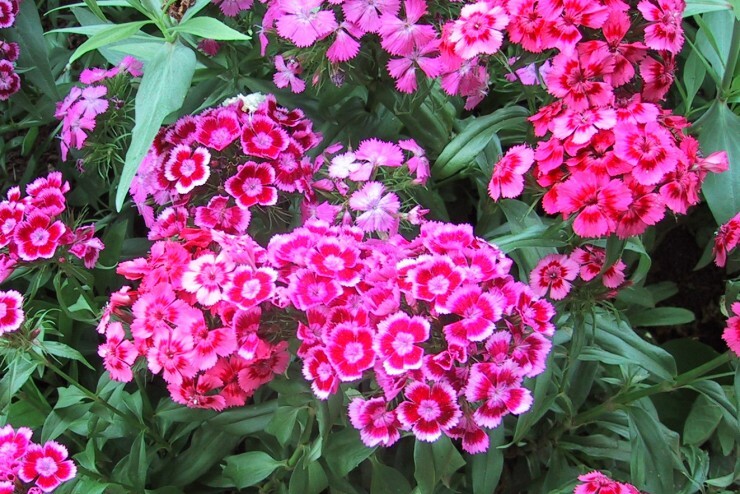 Sweet William (Dianthus barbatus) bloom at Monticello in May. 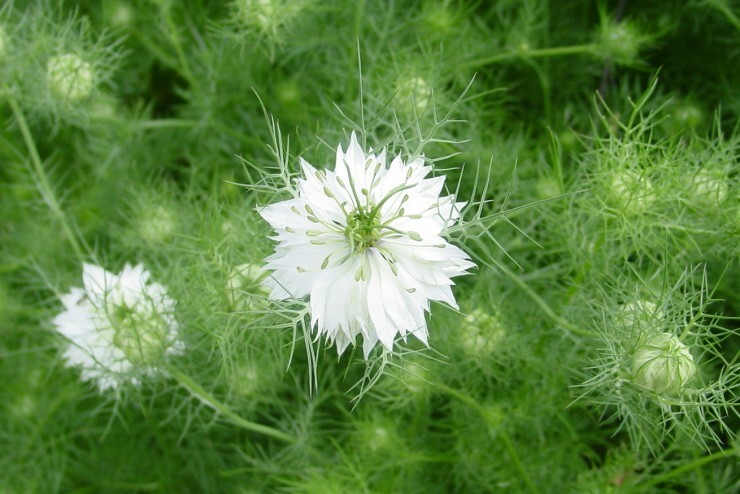 Love-in-a-mist (Nigella damascena) is another late spring bloomer. 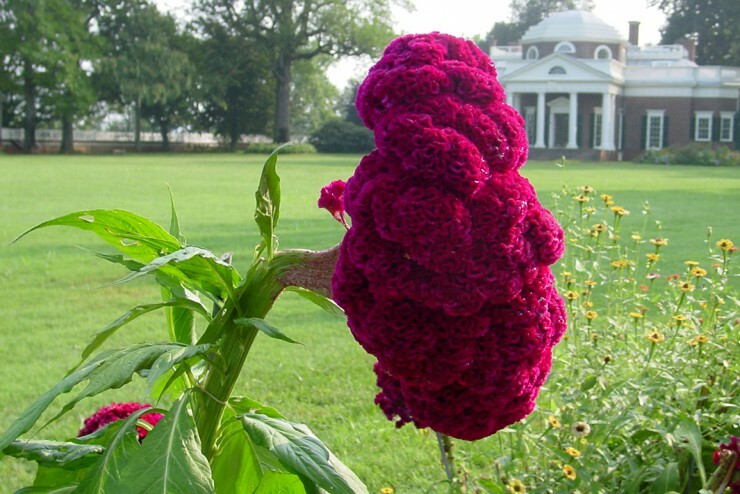 After first blooming in late May or early June, Cockscomb (Celosia cristata) stays around deep into Autumn. 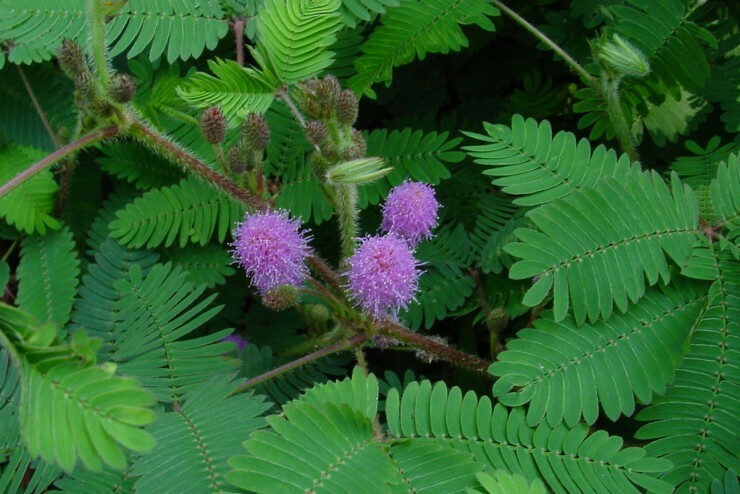 Sensitive Plant (Mimosa pudica) blooms in late July or early August, but it's always fun to watch its leaves fold together when touched. 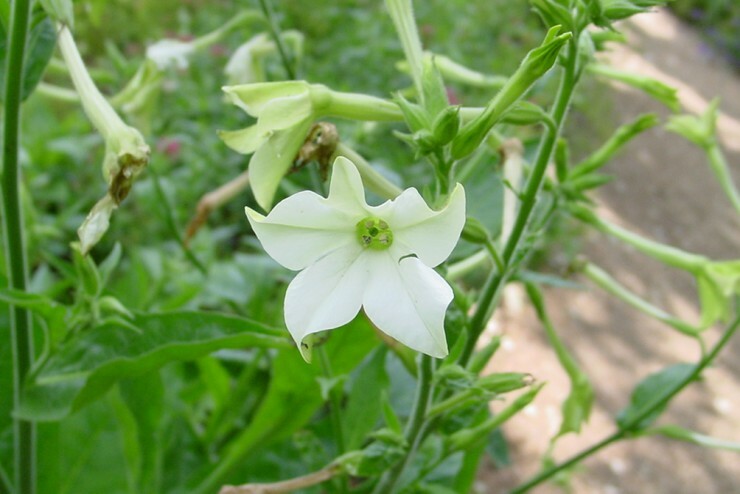 Flowering Tobacco, is usually grown as an annual for its sweet-scented, white flowers that open only in the evening or during the cooler parts of the day. Documentary evidence suggests that Jefferson grew approximately 105 species of herbaceous flowers. Although this is a remarkable number, there were undoubtedly numerous species not mentioned in his Garden Book and other memoranda. For example, Jefferson received a yearly shipment of as many as 700 species of seeds from the Jardin des Plantes in Paris. Most years this shipment was sent by Jefferson to more devoted American plantsmen, but still, many were surely planted at Monticello and not noted. Today, the species recorded by Jefferson provide the foundation for the flower gardens; however; flowers listed by Bernard McMahon in his Calendar, 1806, are occasionally grown as well. The gardens are planted as many as three times a year. 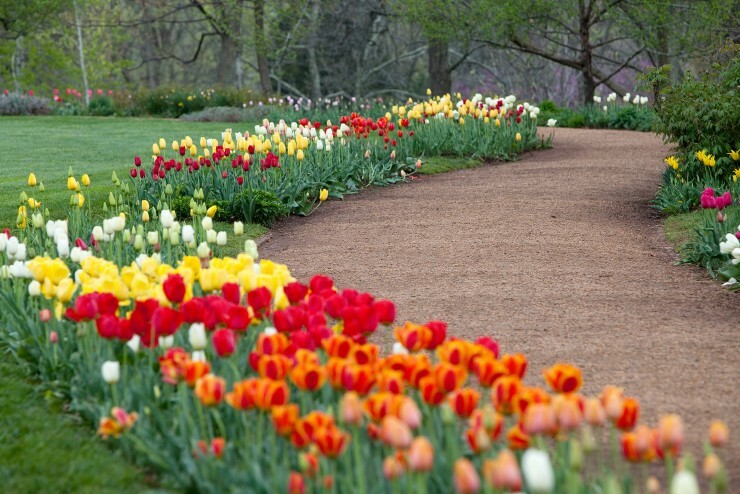 In late April spring bulbs, especially tulips, dominate the stage and probably unify the gardens more than at any other time of year with their showy displays of color. By mid-May, and continuing until the middle of June, numerous biennials and perennials, from Sweet William to Canterbury bells to foxglove, come into bloom. They are complemented by the flowering of old rose varieties as well as hardy annuals -- plants that thrive in the long, cool Virginia spring, such as sweet pea, poppy, stock, larkspur, and calendula. By mid-July, and often continuing through October, warm season annual flowers rule the garden. The gardens include many of the species forms of what are now commonly grown annuals, including zinnia, geranium, heliotrope, French and African marigold, ageratum, and others. These plants reflect the undeveloped flower that, in some cases, Jefferson would have known. Many of these plants have a low proportion of flower to foliage, they are often leggier than modern forms, and some have simple, single flowers. The effect is more like a wildflower garden, especially in August and September as the plants grow up and set seed, which is collected, cleaned, and packaged for distribution. In some cases, as with the florist's flowers Jefferson ordered from Bernard McMahon, ornamental species grown in the nineteenth century were quite evolved; that is, the flowers were doubled, their petals might be striped, fringed, or mottled. The restored gardens include some cultivars of columbine, sweet pea, primrose, pink, and wallflower that were known in the early 1800's. In some instances, when a flower grown by Jefferson was highly developed yet unavailable today, modern cultivars that resemble the earlier variety are cultivated. This is the case with snapdragons, hyacinths, tulips, anemones, and china asters.